When Titus Caesar sacked Jerusalem in 70 AD, many objects, and records of them, were destroyed. Once that generation was deceased, even the memories of many things died. There was no record of a pool of Bethesda, although the Greek Textus Receptus and the King James Bible retained the reading. Modern versions, assuming the TR & KJB were in error, changed it to Bethzatha, Bethsaida, or other names. Trogyllium, likewise, was lost to history. The TR & KJB retained the reading, but the modern versions, thinking there was no such place, dropped it altogether. 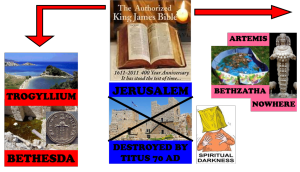 Then about 1960, both the pool of Bethesda and the city of Trogyllium were excavated (and restored) proving the KJB reading was correct all along and the modern versions (virtually all of them) were wrong in both instances. Trogyllium, also now called St. Paul’s Port, currently hosts the best seafood restaurant in the Aegean Sea, specializing in mullet. The Diana coin simply shows the KJB was right to call her Diana in Acts 19. Even the Greek texts call her Artemis. Artemis is the Greek equivalent of the Roman (Latin) goddess Diana, so it is not necessarily an error to call her Artemis, but the coin shows they DID call her Diana, in Ephesus, during the time of Acts. This is not a specifically creation-related defense of the KJB, but it is an archaeologically-related defense. The two go hand-in-glove in defending the truth of the scriptures. This illustrates the KJB seeing before 70 AD, while the modern versions couldn’t. Thus, the KJB reading is actually the “oldest and best” reading. Excellent! I love how minute details even as these vindicate God’s English Bible!